Lynn. Betty. Shirley. Robin. Ann. Sheryl. Leigh. If I asked you to guess which of those women is the youngest, I bet you’d figure it out. One of the names is of a more recent era. The correct answer is Leigh. She is in her 30s. 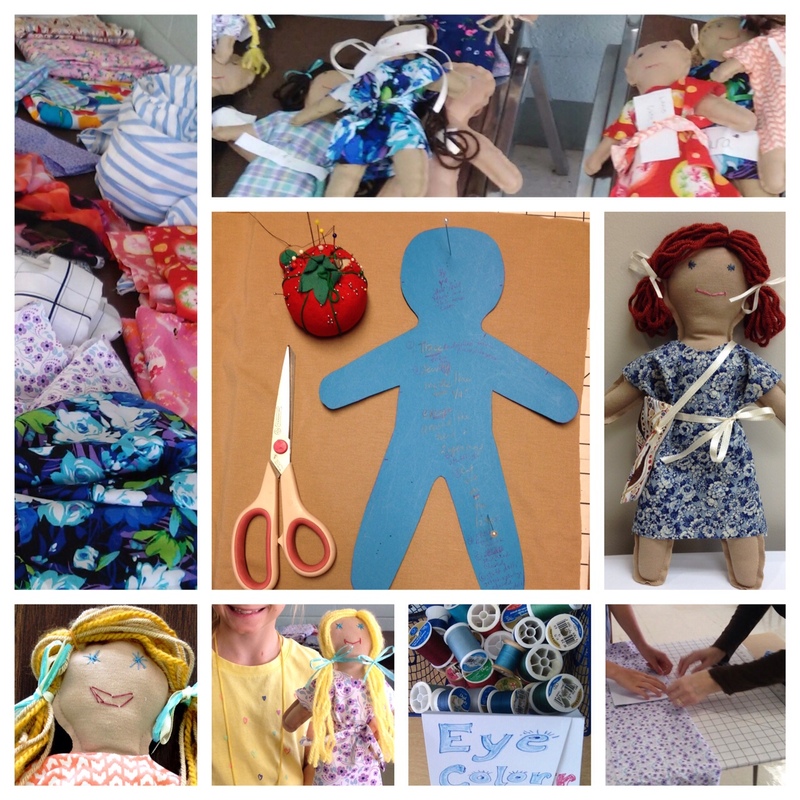 These ladies and I taught sewing by hand during a church art camp* earlier this summer. Two of our senior-most helpers are in their early 80s. The 19 students we taught are a bit younger: ages 8-12. We helper ladies were like worker bees all over the large classroom into which had been brought extra tables to hold fabric cutting boards, spools of colored thread (a veritable Avon book of eye and lip colors! ), and stacks of donated material. We were threading needles, measuring yarn for hair, sharing the sharpest scissors, helping younger hands to puncture the fabric in just the right places, and living the most enthusiastic and successful intergenerational project anyone could ever hope to see. None of this would have been possible without the volunteer efforts and unique organizational talents of Ann, Robin, Leigh, Betty, Shirley, Lynn, and Sheryl. Hear my “shout out.” See my “high five.” Understand my “Praise the Lord!” Smack dab in the middle of the most intensive writing I have done in more than ten years, an entirely different creative side of me had one of its crowning moments. *Arts on the Mountain Children’s Camp at Vestavia Hills Baptist Church is directed by Dr. Beth McGinnis and facilitated by both Dr. Terre Johnson, Minister of Music, and Nancy Akins, Minister to Children and Preschool. In the context of worshiping our Creator through the arts, this camp has provided hands-on training in everything from pottery to flower arranging, knitting to cooking, origami to creative writing, painting to photography. Plus choir, organ, and ukulele! That scene from a favorite television series came to mind in Sunday School class on July 12 during our lesson from Job about “secondhand faith.”* Secondhand faith may be defined as knowing about faith (because of being around people who believe in God, and because of attending church), but not knowing the Lord very well through personal experience. If that’s the case, and we are in a crisis, and a friend who “knows a good prayer” isn’t handy, what confidence do we have? In the 1949 film version of Little Women, Marmee tells her daughter Jo, “I pray to the Lord to send you as little sorrow as He sees fit.” I am tempted to add, “but enough to give you firsthand faith.” I.e., faith that is firmly established during sufficient experience of worry, fear, sorrow, or anger that proves to you beyond doubt how fully your Lord understands your heart, your hopes, and your hurts; and proves to you, through the comfort you receive, how greatly He loves you. In Sunday School yesterday, our teacher Doug Arendall began by listing a number of thrill-seeking activities about which one might hear or read, but which the experience of would be much more powerful: bungee jumping, rock climbing, cliff diving, skydiving; and also some sights on solid ground that would cause us to marvel much more in person than in picture or video: the Taj Mahal; the Great Wall of China. I have experienced few, if any, of the things Doug listed on the board. However, today is the 43rd anniversary of my near-death experience at age 11; that event very surely helped to forge my “firsthand faith.” Read more about that here.